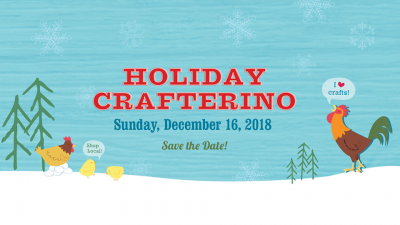 We are now accepting vendor applications for the 2018 Holiday Crafterino! This year marks the 10th anniversary of the Petaluma Holiday Crafterino! It will take place Sunday, December 16th from 10am to 4pm at the Petaluma Veteran’s Memorial Building! The application period will be from July 15th to Sept 15th. The Holiday Crafterino was founded to promote local artisans and crafters as well as to raise money to benefit COTS (The Committee On The Shelterless) COTS provides meals and beds for people in need in the Petaluma area. To date we have raised over $12,000 for COTS and we continue to support them by donating all raffle ticket sales and door fees to them. We are looking forward to hosting our biggest show yet — with room for more vendors, new commemorative swag bag items and more. Mark your calendars and apply to be a vendor today! Please email us at holiday.crafterino@gmail.com with any questions. Thank you!